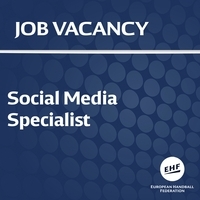 The European Handball Federation is looking for a social media specialist, based out of its headquarters in Vienna, Austria, starting in January 2019. Working across the sport’s top competitions including the VELUX EHF Champions League, Women’s EHF Champions League and EHF EURO national team events, this is an exciting opportunity for an experienced social media expert to drive further growth in the federation’s fan base. Over 900,000 people already follow the federation’s numerous channels across social media and there are ambitious plans to reach and engage many more people in the future thanks to a new partnership with Infront and the DAZN Group commencing in 2020. The successful candidate will manage social media channels on a day-to-day basis, coordinate campaigns and work to develop new ideas to reach, engage and grow the fan base. The role will involve working with external agencies to create content (video/graphics) for publication on EHF channels. Other key aspects include listening and responding to the handball community and also tracking and monitoring analytics to maximise performance across campaigns and channels. This is a full-time position based at the EHF office in Vienna. The role will involve working at major international handball events including the VELUX EHF FINAL4, Women’s EHF FINAL4 and EHF EURO final tournaments. The EHF is the umbrella organisation for handball in Europe and has 50 member federations. Its tasks include the organisation and management of high-profile handball competitions such as the VELUX EHF Champions League, Women’s EHF Champions League and the EHF EURO events. The federation’s diverse range of responsibilities also include managing player transfers, development and education programmes as well as the promotion of additional forms of the game including beach handball and wheelchair handball. 60 members of staff work at the EHF headquarters in Vienna, which is home to both the EHF and its marketing arm, EHF Marketing GmbH. More information at: eurohandball.com and the EHF Business Report 2017. This is an exciting time to join the EHF and its communications team. In May 2018, the federation and EHF Marketing GmbH announced a new half-billion-euro long-term media and marketing deal with two of the leading agencies on the international sports market, Infront and the DAZN Group. The contract starts in 2020 and runs through to 2030. At the core of the partnership is a new long-term strategy, which will see the two companies work closely with the EHF and EHF Marketing GmbH to secure significant growth for the sport across both existing and new markets. A key focus of the strategic plan will be to grow the appeal of the sport, particularly to younger audiences, through an enhanced digital offering. The Austrian capital offers one of, if not the, highest quality of life in world and regularly tops the list of the most liveable cities. Vienna is a well-known tourist destination thanks to its magnificent historic buildings and museums, coffee house culture and its vibrant cultural scene including the world-famous Vienna State Opera House. For its inhabitants, the city also offers excellent health care and education, affordable housing, cheap and efficient public transport, plenty of green spaces and close proximity to the countryside.